Rhino Ridge Safari Lodge - Hluhluwe - iMfolozi Park Accommodation. 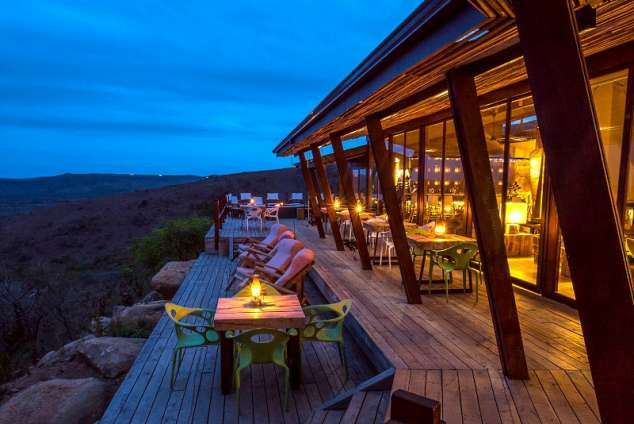 Rhino Ridge Safari Lodge the only private/community owned lodge in Hluhluwe iMfolozi Park commands spectacular views over 96 000 hectares of Big 5 territory and an active waterhole. A sense of peace & relaxation is exuded by the chic eclectic design of the lodge. A maximum of 36 guests are accommodated in either Honeymoon Bush Villas with private plunge pools, luxury Bush Villas with lounge area, fireplace & private decks or Safari Rooms (ideal for families with young children). Twice daily game drives are conducted in the park home of White Rhino Conservation. Guided Bush Walks are highly recommended. Two Honeymoon Villas nestled in the indigenous bush with private plunge pools, offering total seclusion & private plunge pool. Eight Luxury Bush Villas - Expansive open plan bedrooms with lounge area, fireplace, mini bar, full bathroom & large viewing deck. Four Safari Rooms - Family friendly rooms with private shower rooms opening onto deck. Bathrooms - All Villas have open-plan bathrooms with rain showers. En-suite bathroom, separate toilet, luxurious shower. Air conditioning, fans and Mosquito nets in all rooms. 20m infinity lap pool with sundeck. Morning and evening safari drives with highly experienced rangers in the heart of Big Five territory. DO NOT USE GPS. Please use directions you receive from our reservations office. Travelling time by vehicle from Durban to Rhino Ridge Safari Lodge via Nyalazi Gate is approximately three hours (270km). There are daily flights from Johannesburg (ORT - 1hr 15mins flying time) to Richard's Bay Airport. It is an easy 1hr 45min drive in 2x4 vehicle from the airport to the lodge. Speak to our reservations department to arrange a road transfer or hire a car at the airport. Daily flights from all domestic & regional destinations land at King Shaka International Airport which is an easy 3hr drive to the lodge. Speak to our reservations department to arrange a road transfer or hire a car at the airport. Rhino Ridge Safari Lodge - after Gate Closing (Self Drive Only): Hluhluwe iMfolozi Park has 3 entrance gates, Memorial Gate to the north, Nyalazi in the east and Cengeni to the south. Guests must arrive at gates at the latest 10 minutes before closing time. Guests arriving after this will not be allowed access to the park and will have to overnight outside the park. 102 page views since 13 Mar, 2019.